In a slew of reports published in the US last year, the number of women working in the tech industry was only 30%, despite the fact that women account for 59% of the total workforce. In the face of the these challenges, SweetIQ surpasses the industry’s average by 15%. In the wake of International Women’s Day, we’ve decided to introduce a few of the exceptional women who push our company further every day. To read previous posts in this series, click here. Meet Lindsay Holesh, Director of Agency Sales North America at SweetIQ. Lindsay started her meteoric ascent to the director position a year and a half ago. She is in charge of building and leading a team serving the Canadian market for agencies. She’s responsible for bringing big brands under the agency umbrella such as Reitmans, KFC, Pizza Hut and Taco Bell amongst others. Lindsay sat down with me to talk about how she landed in tech, the qualities that make a great sales agent –male or female, and her vision of how women are shaping the salesforce within the tech bubble, one client at a time. 1. Tell me a bit about your background. Where are you from and where did you go to school? I was born in Johannesburg, South Africa and migrated to Toronto at a very early age where I grew up. After finishing high-school, I wanted to change the world so I decided to study Political Science at York University, where I got my bachelor degree. Yes… a sales person with a degree in political science. Selling anything requires being political in many ways. 2. How did your background lead you to where you are today? After finishing school, I decided to take some time to define what I wanted to do next, so I started working at the Levi’s flagship store in Toronto. While working there, a gentleman who was an executive at CIBC at the time, scouted me out of the jeans store and offered me a position as a junior financial consultant. I took my chances –and a pay cut– and went to work at CIBC. After completing the exams required, I was doing transactions on the trading floor for my clients. Then came motherhood and a move to Montreal, where I did a bit of fundraising for an NGO. During that time I decided to start my own company, catering to moms who needed to make an income while working from home. I saw all these women who had home-grown businesses, sewing blankets for babies, making organic diapers, etc. But there was no way for them to connect with each other and advertise their products. So I created a directory on a website where they could put themselves out there – an organized spaces for them to actually sell their products. 3. How was that first incursion into entrepreneurship? This was the pre Facebook era, so there wasn’t a direct way to connect with that community, but –without knowing it– this was my first brush with Local Marketing. I wanted to build relationships with that audience since I could identify with them. I was a mom and I understood the struggle it can be for many women to generate an income and be part of the active economy while staying home. And yes… it is possible. You can be a mom and an entrepreneur. One thing does not prevent the other. Actually, being a mom gives you many tools you can apply to your own business and your career. 4. What happened next — how did you land in tech? My website was acquired by a Montreal startup that was looking to offer moms ways to find activities for their kids. They brought me to work with them and that was my first experience selling Tech. I then went on to work for another tech company that sold ad-space, where those years in the trading floor came handy. After all, bidding for ad-space is not too different from bidding for stock. 5. How was that first experience in tech, and your first interactions with leaders at work. What were they like? Were they women or men? The company that acquired my directory (The Kid Scoop), was owned by women, so I jumped into an executive position with them straight away as Director of Business Development. It was a tough time as I’m sure anyone building a startup can attest, but it was also very gratifying to see all these women coming together, leading the business and creating a revenue stream for the company. 6. Tell me about your jump to SweetIQ: why did you choose to take the next step? 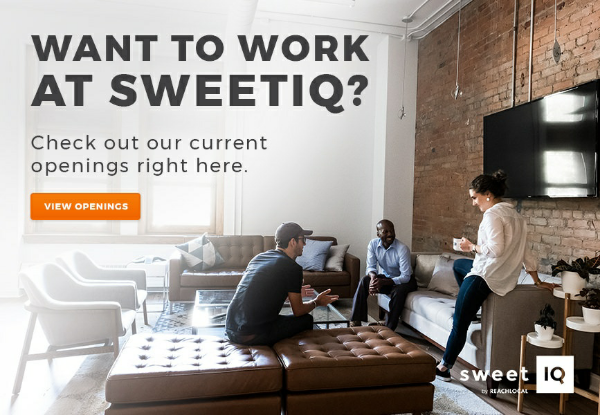 I am always on the lookout for bigger challenges, and suddenly I heard about SweetIQ. What I loved about the company is that it is about something I use on a daily basis. Local search was something I knew and understood, and I saw an opportunity to create change and offer a solution to my clients. Having the background I have, having worked in retail, stock trading, having started my own business and doing sales for tech companies, this felt like a natural evolution. In sales –no matter if you are a man or a woman– you need to relate to your clients. You need to get in their shoes and understand their needs and challenges. I understand the challenges of a brick and mortar business since I ran one and I know how important foot traffic is. Joining SweetIQ felt natural and like I landed in the right place. Selling the platform is the result of being empathic with my prospects, understanding them and building a relationship where I’m not just pushing the product but also offering my expertise in return. 7. Do you think that equality has been achieved in the workplace for women, or is there more to do? Also, what’s it like selling the platform in such a competitive industry? The KPI’s in sales are clearly defined. You can be a woman, a guy, an alien or a teenager. If you meet the metrics, you are doing your job right. If you exceed them…then you shine. Monthly performance is clearly measured. Companies even have leaderboards with positions and numbers. Again, your gender doesn’t make any difference. Just hit your numbers. Remember what I told you about mother skills being helpful? Well…sales is all about relationship-building, trust, empathy, communication, respect and nurturing. If that doesn’t sound like a mom to you, I don’t know what does. Diversity in tech is a hot topic now. This means more companies are aware and willing to hire a more diverse workforce, and that’s a great opportunity for women to show leadership and expertise. 8. What advice do you have for women going into a tech environment who want their career to grow? There’s always something I tell young women who approach me in general –tech or no tech: you have to be where the money is. Financial independence allows you to control your own destiny and it empowers you to do anything you like. Many women ask also how being a mom plays a part in your professional development, and I think there is a time for everything. Sure, you might need to slow down a bit and lift your foot off the pedal, but there is absolutely no reason why one thing should deter you from doing the other. My advice: Build your village. I have a village of women around me and we all have one another’s backs. It is a very powerful connection and it becomes your support system. From the girl who helps you with your nails to your mom babysitting your kids. Build and use that support network. 9. How do you recommend women should go about overcoming the challenges they face in a concrete way? SPEAK UP. Always speak up. If you don’t like something, say something. Don’t assume that people around you know what you’re thinking. Don’t hold yourself back. If you find a place where you can thrive, put your foot on the gas and get after it. You can get married, you can have children if that’s what you want, but remember all those things are doable while you grow as a professional.